The great artists of the Aztec Empire bore the title of “tolteca”. This was because the skills that they practiced originated in the ancient Toltec civilization. The title tolteca meant that they were exquisitely skilled craftsmen. They excelled in feather work, goldsmithing, jewelry making, and the cutting of gemstones. The term for their technique was called toltecayotl, or “the Toltec thing”. These craftsmen worked with simple tools and infinite patience. It is said that nothing was difficult for them and everything made was of the first order. According to early chroniclers many of these artisans were not Aztec in origin but instead came from distant lands where their crafts were first learned. However, it is believed that feather working was a skill that was solely Aztec in origin. Featherworkers were called amanteca, and they made head-ornamentation, feather-mosaics, and door-ways. This was done by fixing brightly colored tropical feathers on light reed frameworks. The goldsmiths were from an area east of Tenochtitlan called Yopi. They worshiped the god Xipe Totec who carried a shield of gold in his hand. The Yopi were called tlappaneca or “painted men” because they died their bodies with different colors. These people knew everything about precious stones. The tolteca never became wealthy, however they were well paid and held a position of high esteem. For example, fourteen sculptors were commissioned to make a sculpture of Montezuma II. They were given cloth, 10 loads of calabashes, 10 loads of beans, 2 loads of peppers, 2 slaves, cocoa, cotton, a boat load of corn, and a boat load of cloth. They were likely paid this in stages as the work developed. Tenochtitlan was filled with sculptures and innumerable bas-reliefs. Everywhere there were both religious statues and statues of daily life. These statues adorned the great halls, plazas, temples, and palaces. In addition, great murals decorated the walls of the city. Much has been made of the gifts that Montezuma gave Cortes. The first gift was a costume of the Aztecs primary god Quetzalcoatl. It was a beautiful turquoise mask with a plume of quetzal feathers, a great jade disk with gold inlaid in the center, a shield made of gold, and mother of pearl with quetzal feathers, a mirror decorated in turquoise, a bracelet of golden bells and jewels, and sandals decorated in obsidian stones. All of these were said to have been of highest quality. 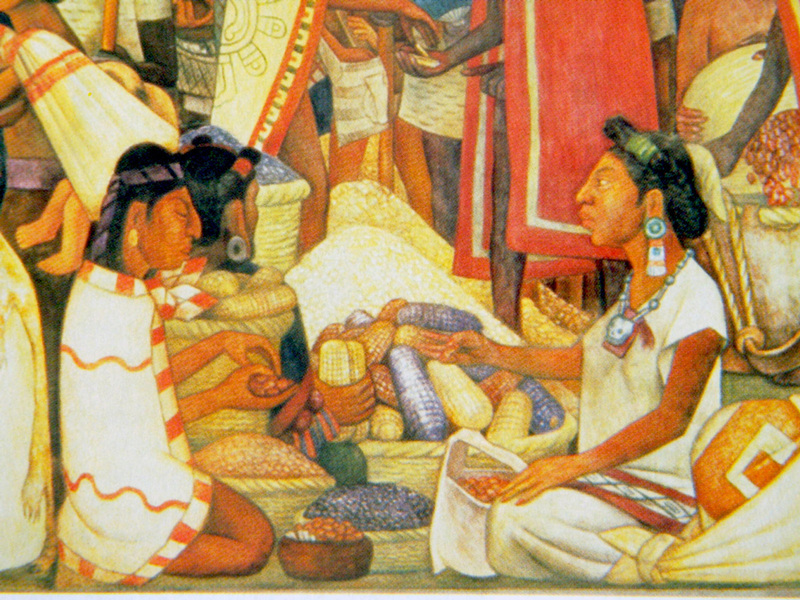 Montezuma also gave Cortes ten loads of cloth made out of feathers and cotton. He also gave King Charles V, a wheel 6 feet 10 inches wide made out of gold that represented the sun, and a gold necklace with 183 emeralds.